Last week, Warner Bros.' big screen adaptation of The Flash suffered a serious blow, when director Rick Famuyiwa parted ways with the project over creative differences. The director was reportedly eyeing an "edgier" approach to this character, which clashed with the studio's plans for the property, but it seems that won't slow down the production process one bit. While promoting his new film Fantastic Beasts and Where to Find Them, Ezra Miller claimed production will happen by the end of this year. "We don't know right now [who the director will be], but I think we'll start this year, I think it's coming up pretty quick." Some are still wondering if Warner Bros. plans on keeping its March 16, 2018 release date for The Flash, after the studio recently gave out that same date for the upcoming Tomb Raider remake. While the studio hasn't announced any new release plans for The Flash, Ezra Miller spoke about the complex development process in an interview with Collider. Here's what he had to say below. "These processes are complicated, and I think it can-from afar-appear to be, as you say, something interpersonal or dramatic. That is rarely the case. These are groups of people taking the development of projects extremely seriously, and the teams are changing all the time. There's often a lot of flux in who the team of the production of a film is before that production starts, and in this case, you hear about it, because it's a critical figure-the directors that have been coming on and leaving. For me, it's sort of a tragic relay race, and we've had a couple really incredible people carry this baton, and their marks are left on that baton, and the work that they've given to the project will certainly be represented in whatever the final product comes to be." We first saw The Flash in a cameo appearance in this spring's Batman v Superman: Dawn of Justice, and we will next see him in action in the highly-anticipated Justice League, which hits theaters November 17, 2017. 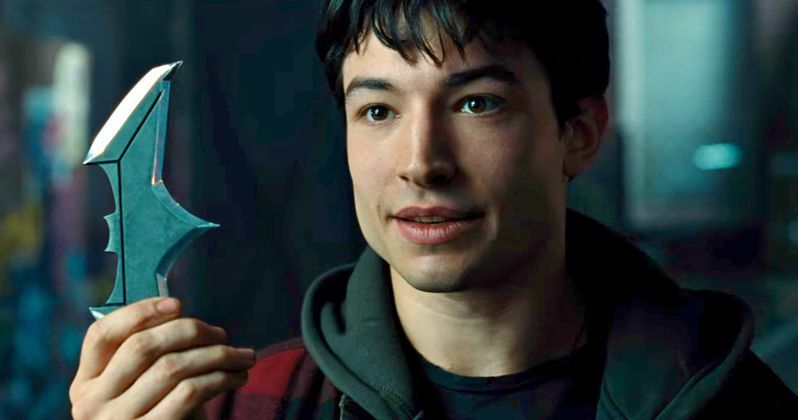 We still don't know much about the story for this stand-alone Flash movie, but Ezra Miller revealed that he has been doing research on this character ever since he first considered the role. Here's what he had to say below. "I mean I've been investigating and composing the character since the moment I started considering doing the screen test. Fortunately, a lot of that research is extremely fun and involves reading Flash Comics and other comics from the world of DC, The Brave and the Bold, and I'm really interested in the early history and some of my favorite stuff is Silver Age. Even the Golden Age and the Jay Garrick stuff, the original Flash. It's just so fascinating, so endlessly compelling. It's such an incredible set-up for exploration, all these fascinating concepts in physics, in mysticism, in fantasy... he can go anywhere. He's that figure of the DC pantheon who transcends the realms, sort of like Hermes or Mercury before him in the respective Greek and Roman mythologies that the character's (creator) Gardner Fox clearly very much based (him on)." As for the departure of director Rick Famuyiwa, Ezra Miller said that it's "deeply unfortunate" that things didn't work out and the filmmaker left the project. He did add that he trusts the process and the studio and he's excited for what's to come. Ezra Miller will be joined in The Flash by Kiersey Clemons as Iris West, Ray Fisher as Cyborg, and Billy Crudup as Dr. Henry Allen.